We had a great turn out for the first WSCB hosted lecture, “Wisconsin’s Conservation Legacy,” by Dr. Curt Meine, Senior Fellow at the Aldo Leopold Foundation and Center for Humans and Nature, and adjunct faculty in the Department of Forest and Wildlife Ecology. Dr. Meine explored Wisconsin’s past, present, and future in the changing landscapes of conservation in the state and beyond. Stay tuned for WSCB hosted lectures and events in the future! As we inaugurate the new Wisconsin Chapter of the Society for Conservation Biology, and look forward to hosting the 2016 North American SCB meeting, it is a perfect moment to pause and reflect on Wisconsin’s unique role in the emergence and evolution of conservation. 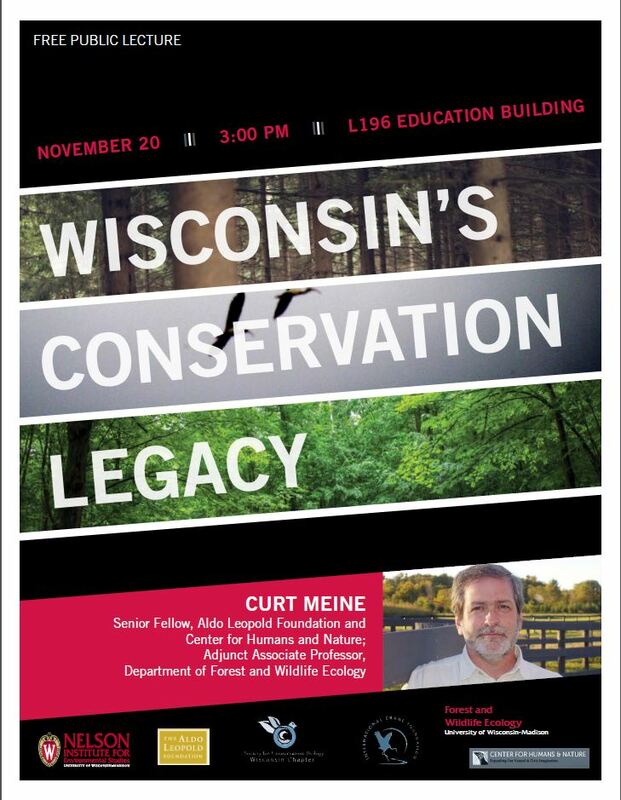 Dr. Curt Meine will present a wide-ranging overview of Wisconsin’s conservation legacy, highlighting key events, figures, and institutions that have made their mark on Wisconsin’s landscape (and beyond). Whether you are a long-time Wisconsinite or a recent arrival… a veteran conservationist or just embarking on a career… a prospective professional or an interested citizen… please join us as we look back to our history—and ahead to our future! This lecture is co-sponsored with the UW Nelson Institute for Environmental Studies, Aldo Leopold Foundation, International Crane Foundation, Center for Humans & Nature, and the UW Department of Forest & Wildlife Ecology. Posted on November 19, 2014 November 26, 2014 by wisconbioPosted in EventsTagged Conservation History, Events, Wisconsin.